I am one of the leaders for our Ward's Activity Days program (girls 8-12). Every so often we have a Show and Share night so the parents can see what the girls have been doing. When we planned the activity we had tonight, it was supposed to be in March, so I suggested that for our theme we could do Lions and Lambs. On one hand, there's the little saying about March, the it comes in like a lion and goes out like a lamb, and on the other hand, there's plenty of Christian symbolism to lions and lambs, especially if we were going to do it just before Easter. Well, with several Wards meeting in our building, there are serious scheduling issues, and we couldn't get the gym until tonight. That meant that the March part of the theme was toast, but since nobody felt like coming up with a new theme we just went with "And the Lion shall lie down with the lamb." I had two assignments. The first was to do centerpieces for the tables. I thought it would be really cute to just gather up all of the lion and lamb toys we have around the house, and arrange them artfully. I knew that Lizbeth had a lot of little lambs, because she likes them almost as much as kitties. I got a couple of big lions for 50 cents each at the DI, and then went through the toy boxes to pull out the other random ones we had. I put them all in one of the big boxes that bulk diapers come in, and it was full to overflowing by the time I was done, and I know of several that never made it into the box. With the Easter grass and plastic eggs that we also decided to use even though Easter was weeks ago, it really looked good. I've been asked to talk a little bit today about our theme: The lamb shall lie down with the lion. We sing about it in the hymn The Spirit of God: How blessed the day when the lamb and the lion shall lie down together without any ire. Scripturally, it comes from a passage in Isaiah chapter 11 verse 6 where he's talking about the peace that will come after the wars and Judgement Day at the end of the world: The wolf also shall dwell with the lamb, and the leopard shall lie down with the kid; and the calf and the young lion and the fatling together; and a little child shall lead them. When I looked that up, I was surprised -- there are a lot of animals mentioned in that verse, and though the lion and lamb are both there, they aren't particularly close together, and yet in the song, and all kinds of Christian art, they're the two animals shown lying down together in peace in the millenium. After doing a bit more searching, I found that the connection came from another prophecy about the end of the world, this one in Revelation chapter 5. Sitting there by God's throne, John sees a book that's sealed with seven seals. It's called the Book of Life, and everything everybody has done is written inside so they can be judged. But John is sad because there's nobody worthy to open the book and read what's inside. Then in vs 5 it says, And one of the elders saith unto me, Weep not: behold, the Lion of the tribe of Juda, the Root of David, hath prevailed to open the book, and to loose the seven seals thereof. 6 And I beheld, and, lo, in the midst of the throne and of the four beasts, and in the midst of the elders, stood a Lamb as it had been slain... 7 And he came and took the book out of the right hand of him that sat upon the throne. So here in John's vision, in one verse, Jesus is called the Lion of The Tribe of Judah, and in the next, He's suddenly called the Lamb. We're used to thinking of Jesus as the Lamb of God. At Easter we remember how as part of His great atoning sacrifice, He fulfilled the Law of Moses by allowing Himself to be sacrificed as the Passover Lamb to meet the demands of Justice and forgive all our sins if we would repent. John the Baptist said, Behold the Lamb of God, which taketh away the sin of the world. (John 1:29). When the Angel is explaining Nephi's vision of the Tree of Life in 1 Ne 13, he constantly refers to Jesus as The Lamb or The Lamb of God. And it's easy to see how he's like a lamb: Meek, Pure, Innocent, in Isaiah 53, it says, 5 But he was wounded for our transgressions, he was bruised for our iniquities: the chastisement of our peace was upon him; and with his stripes we are healed. 6 All we like sheep have gone astray; we have turned every one to his own way; and the Lord hath laid on him the iniquity of us all. 7 He was oppressed, and he was afflicted, yet he opened not his mouth: he is brought as a lamb to the slaughter, and as a sheep before her shearers is dumb, so he openeth not his mouth. The lion is a bit harder at first, but becomes easier to see as you look more closely. A lion is known as the ‘king of beasts’ He is majestic and strong. These two characteristics in themselves can be applied to the Lord. In ancient days, the King was the one who made the laws, and often acted as the top judge in the land as well (think of King Solomon and his famous wisdom in judgement). In the Old Testament, Lions are often a symbol of God's Justice. Some people are killed by Lions after disobeying the prophets, and other prophets talked about Babylon and Assyria coming to take the Children of Israel into captivity as ravening lions. The most famous Lion story is about Daniel. Because he obeyed God's law, and even the king knew that the law of the land was unjust, the lions that were the instrument of justice had no power to devour Daniel. Christ is the King of Kings, and therefore, the only one qualified to open the book and sit down and Judge everybody on Judgement Day. It's interesting though, that when he does it in Revelation, He's called the Lamb. One of the great problems with God's plan was that everybody who came to Earth would sin, and no unclean thing can dwell in the presence of God. Alma says, in chapter 42 vs 25 What, do ye suppose that mercy can rob justice? I say unto you, Nay; not one whit. If so, God would cease to be God. But because Christ, the only perfect, unblemished, innocent Child of God was willing to suffer and die for our sins, the demands of Justice were satisfied, and He could be merciful at Judgement Day. And if you go back to Isaiah 11, where this whole journey started, you'll see that that's really what that chapter is all about. It talks about how he shall not judge after the sight of his eyes, neither reprove after the hearing of his ears: 4 But with righteousness shall he judge the poor, and reprove with equity for the meek of the earth: and he shall smite the earth with the rod of his mouth, and with the breath of his lips shall he slay the wicked. He's the perfect Judge. On one hand he's merciful to those that try to be righteous, and on the other hand, those that are truly wicked and oppress others will be destroyed. At that point, Justice and Mercy don't have to be at odds any more. The question we should ask ourselves now that we know all this, is which side of Jesus do I want ot see at Judgement Day? 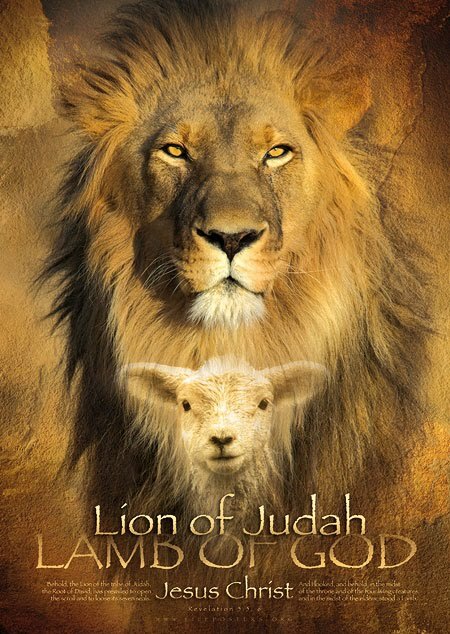 Do I want to meet to Lion, who will judge me guilty for every thoughtless thing I've done, or do I want to meet the Lamb of God, who has already paid the price for my sins and will forgive me if I repent and do as He commands? I love Lambert the Sheepish Lion! Your girls are very lucky to have you as their leader. I enjoyed the post and will have to look up some of the lion stories you mentioned. exquisite, karen. And I want that poster so where can I get it? Sunday Tom Mize who your folks know (I think) bore his testimony..he's a convert. He talked about being raised Catholic and always seeing the cross with the corpus everywhere. And he grew up thinking the Lord was rather timid and weak. But now, since learning other things/another way, he has realized that Jesus is more like Chuck Norris. You can imagine the laughter....and it's such a cool image. Not exactly your lion vs. lamb...but still pretty great coming from this amazing man, and cop. Super great post! Thank you,Karen!